Shane, we had no other way to show our grief for you. It was terrible to have heard on the ‘grapevine’ two weeks too late for your funeral. And then the weeks – no, months, as piece after piece was fitted to the puzzle. I wish so much we could have known the person behind the mask, behind the uniform. That is forever lost to us now. So many lost opportunities. As the panel says: “What could we do, but light a candle for you”. This is a candle that will never burn out. Love from Lisa and Paul. Shane, you were such a special son and friend. You gave so much love and you took so little. You were always there for me when I needed someone and it breaks my heart when I think that I was unable to be there for you when you needed me so much. If only you had had the courage to tell me. If only I could have held you in my arms and comforted you. But you are with me every day now. In everything I do and everywhere I go. You were everything that I would like to be, Shane. Words cannot express how I feel about losing my 28-year-old son, Shane, to an AIDS-related condition. 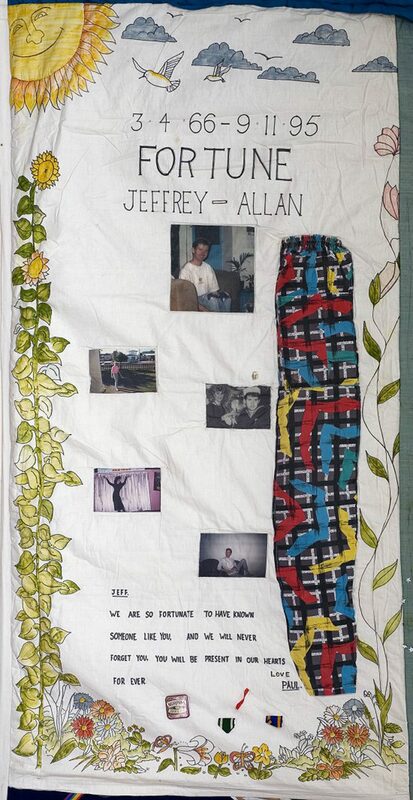 Shane died just 14 days after finding out he was HIV positive, and out of those 14 days, he was conscious for only 8. Sadly, I did not know of his diagnosis until he was unconscious. This has caused me so much heartache. Those precious days when he felt he could not tell me, and at the same time I knew there was something terribly wrong and he didn’t want to talk about it. I know how devastated and frightened he must have felt. Those few precious days when I could have said so much to him but felt that when he was feeling a bit better he would be able to talk about it. Then suddenly that opportunity was gone. – Of course, they know we love them. – Of course, they know we are there for them and they can come to us when they are desperate. – Of course, they know we will support them. But do they really know these things? Do we tell them we love them? Do we tell them they can come to us when they are feeling desperate, ill and frightened? Do we tell them we will support them? How much better equipped we would be to deal with the grief and aftermath if when it was over we knew in our hearts that our son or daughter had known we were there for them and had loved and supported them through this terrible time. How much better equipped our children would be to deal with this devastating news if they knew they could safely come to us and say, ‘I am really ill and I need your love and support’. I now realise how important it is, that if you think that your son or daughter is in trouble, say something, don’t leave it. My one hope would be, if I could change the thinking and the actions of just one mum or dad by telling my story, then something positive would have come out of what was my tragic set of circumstances. The Quilt was assembled over two consecutive Sundays by some of Christopher’s family and friends, four years after his death. It began with no intended structure and ended as a collage attempting to depict his spirit and energy. It has provided us with the opportunity to revisit the strength and joy that radiated so naturally from Christopher. 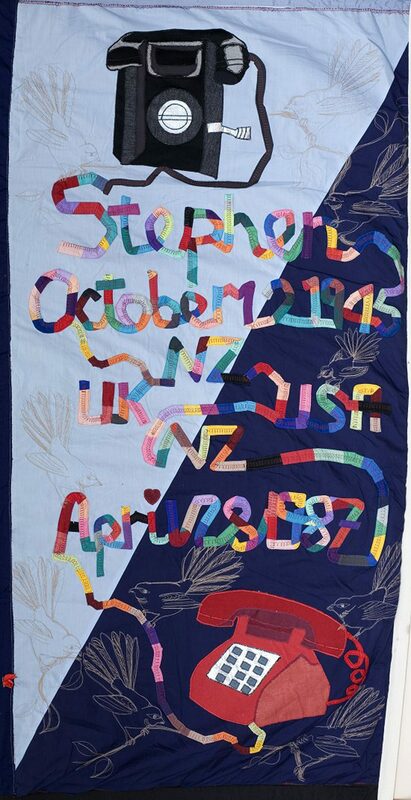 It was evident early in Christopher’s life that there was a specialness about his character that would see him journey far from the small Taranaki town in which he was born and grew up. It was a journey that began in the local repertory theatre, saw him work in Wellington radio, the Auckland record industry, Sydney television, and front fashionable Los Angeles restaurants. At 25 he returned to Auckland where the energy, enthusiasm and style that had always distinguished him blended with the experience of his travel in helping design, establish and run, two of Auckland’s more notable restaurants of the last ten years, the Veranda Bar & Grill and The Metropole. Even allowing for the tendency to speak well of the dead, discussion about Christopher is peppered with references to his positive nature, his smile, his ability to listen, his readiness to compliment, and the wisdom of his thought. Christopher had a focus on his life which meant he invariably achieved those goals he set himself. Christopher died well, not through accepting it meekly but by knowing his life had been successful. 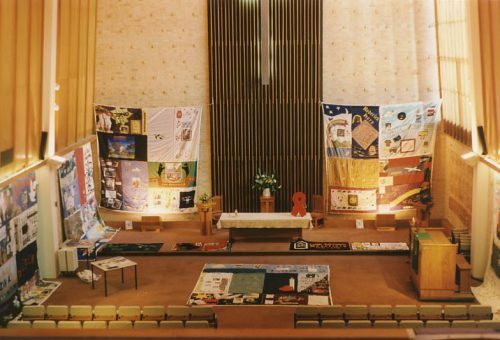 We have attempted to embody that memory in this Quilt, the sea and sun depict his love of the beach and its culture, the yellows represent his favourite colour and the luminous qualities of his nature, the champagne glass his favourite drink and hedonistic tendencies. The crown symbolizes the treasured life he led, Christopher the little prince, stemming he believed from his caesarean birth. 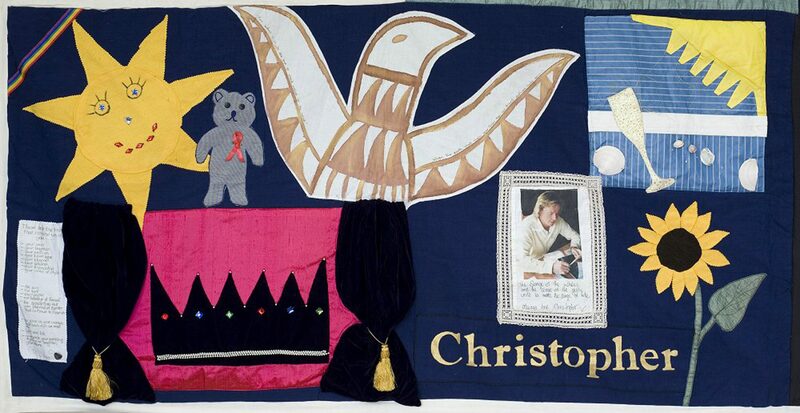 The curtains which encompass it indicate Christopher’s love of the theatre which pervaded his life and his wish to be an actor, director, producer, and writer, all of which he achieved at some level. The bird represents his spirit which still remains. 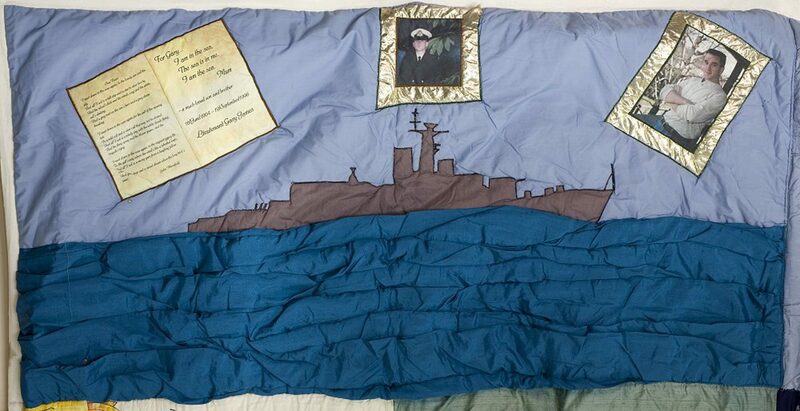 The teddy bear is a tribute from his nephews and nieces who each received one at his last Christmas. 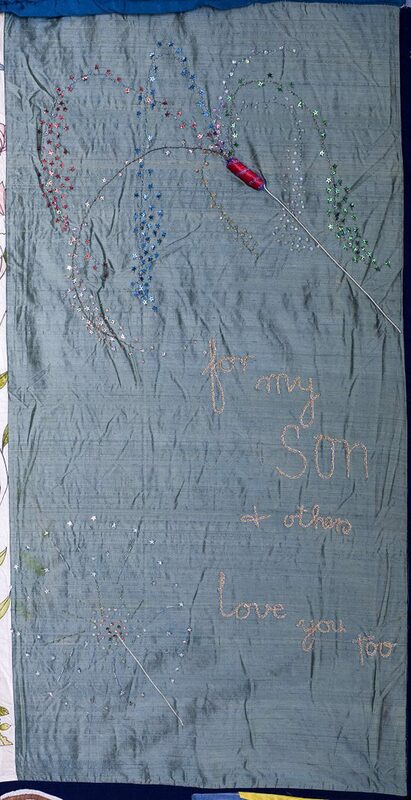 The sunflower was Chris’s often gift to his mother, in his words she was his “light and life”. The pleasure of his company and the agony of his loss will remain as sharp and vibrant among those who knew and loved him as was his own personality. I knew Chris when we were acting, dancing and singing together in a number of shows in New Plymouth. He stayed at my parents’ house sometimes between shows, after some huge parties and then occasionally when we’d catch up socially. I was always very fond of Chris, as was my mum, who choreographed the shows. I lost touch with Chris. But I often remembered the fun times we shared. I was searching for him on the net just to see what he’d been up to, and found him here. I didn’t know. An amazing guy who I will always remember. 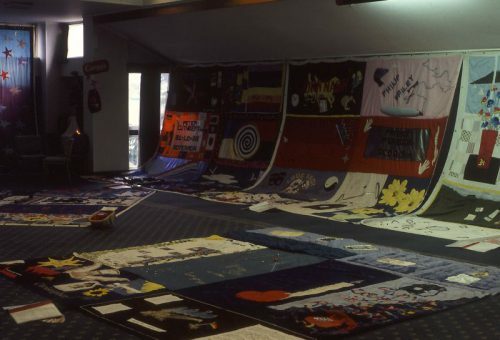 I asked Mike when we saw the Quilt in Nelson a few years ago if he would like one made. His reply was his usual way of dealing with things like this – it was up to me. The decision to finally make one followed a lot of procrastination over the years and it wasn’t until after he died that it was almost forced on me by a friend. I asked his family what they thought of the idea and there was no hesitation so I set about organising what we have before us today. 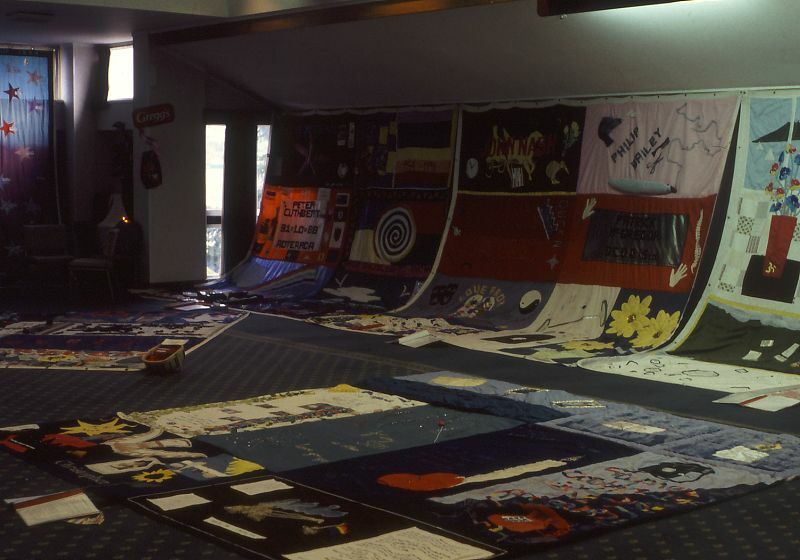 The material for the main part of the Quilt was easily selected. Mike had a piece of velvet set aside for some upholstery work and there just happened to be a piece which measured up almost precisely. We added some black backing material and set about designing the rest. Mike’s name had to be in denim, one of his favourite materials. The name was cut from a pair of his well used and faded jeans and frayed just like most of his cut-offs which he wore constantly in the garden during summer. The gold cord under the name reflects Mike’s appreciation of some of the better things he liked to have around him. The flowers represent his love of gardening, in particular, the orchid and hibiscus. Both that he cultivated at his home are being re-established in gardens in Northland and Auckland as memorials. 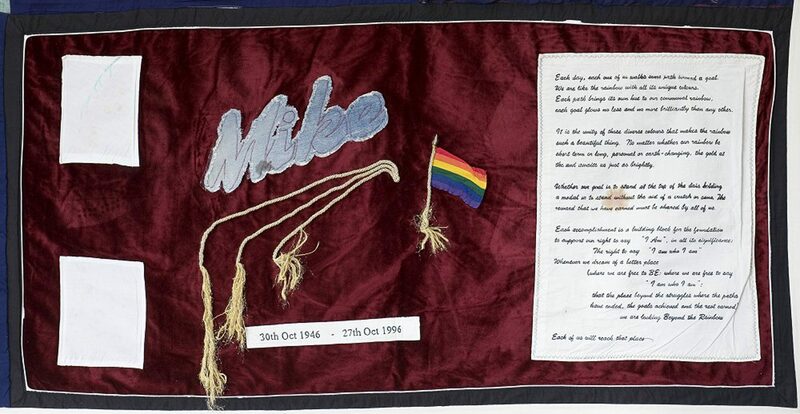 The rainbow flag is one that Mike picked up on one of his trips to San Francisco and it seemed appropriate to go with the text. The text accompanied a piece of music that we first heard in Vancouver, Canada. We were at a brass band concert called ‘Beyond the Rainbow’ and this piece came about halfway through an excellent program. It was dedicated to those who had passed on or in effect gone beyond the rainbow. It had been composed just a few years before in Texas and this was one of the few public performances. It was a very moving piece of music and as we all stood to acknowledge the performance, Mike jabbed me in the ribs and said, “You can play that at my funeral.” We did play it at his funeral but only after I’d spent months tracking down a recording in the United States and obtaining what is possibly the only copy in New Zealand. 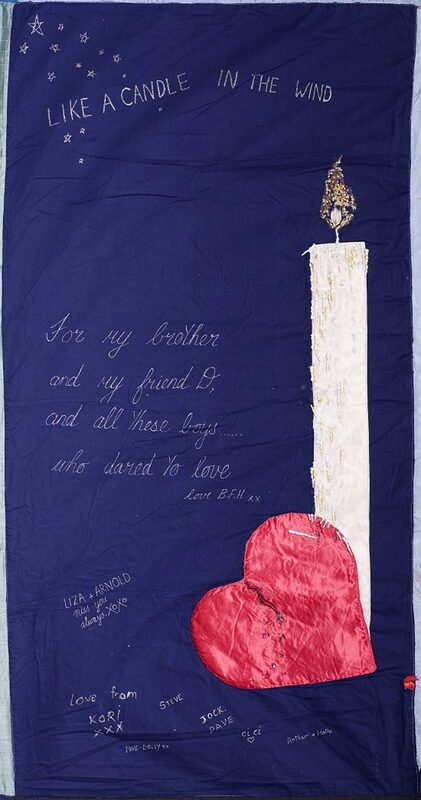 The Quilt for Mike is handed over in acknowledgement of his struggle with HIV, his courage in the face of the pain and the courage of his family and friends to stand by him. He left us some undeniable lessons in life and some surprises in the broad spectrum of people whose lives he touched. He was basically just an ordinary person who never achieved anything earth shattering but he left us all with something. I will never forget my time with him and what he gave me. 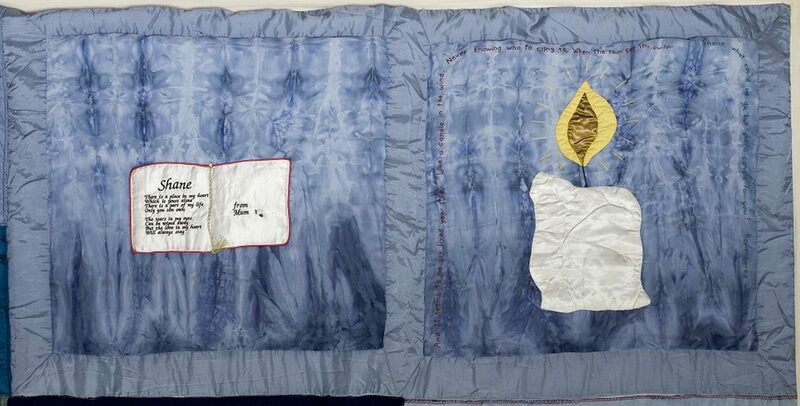 The writings that accompany the Quilt for Mike are lessons to us all. We as close family and friends have learnt from him, we would also like you to learn from him. It was not usual for Mike to ask for help but this he did of an old friend when he found out what he had. They sat in a bar and over rum and cokes they made a commitment to either beat it or see it through till the end. They didn’t beat it but the friend became the lover and Mike died in his arms after almost nine years together. He had a dry sense of humour and was a caring soul. I watched as he bounced my little children on his knee singing them little ditties I had never heard of.